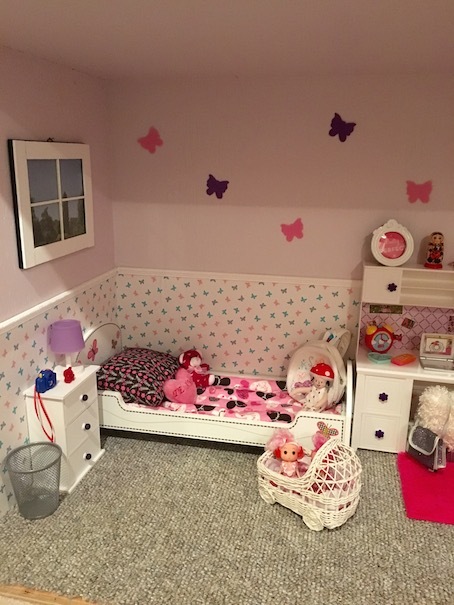 The room that I am showcasing today is the first bedroom! 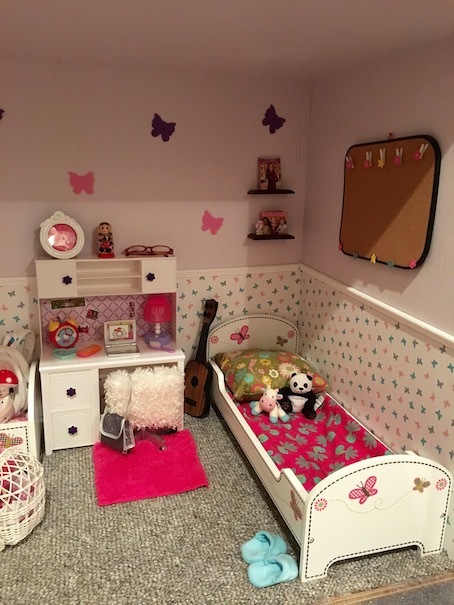 I am not sure yet which of the dolls will end up moving in here, but it is such a cute room! In this room, I used some mini chair rail that you can get at the Home Depot at $3 for 6ft. Just cut it to size, and glue it to the wall. 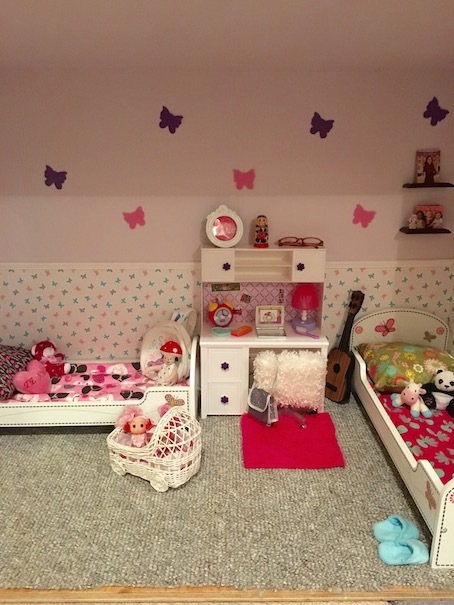 The theme in this bedroom is obviously butterflies. The theme just sort of chose itself. 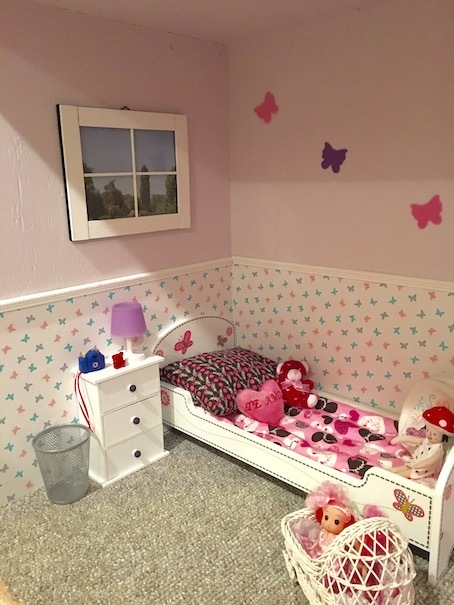 I already had the butterfly beds, and the butterfly wallpaper just happened to match. I had a butterfly cookie cutter, so I traced it onto some craft foam to make the decals for the walls. 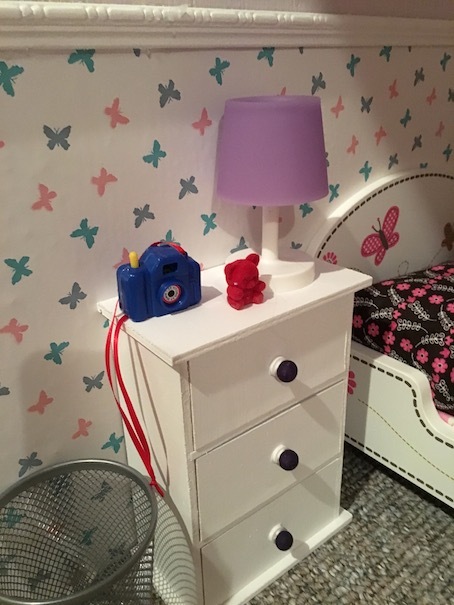 The wall paint colour is a light lavender. 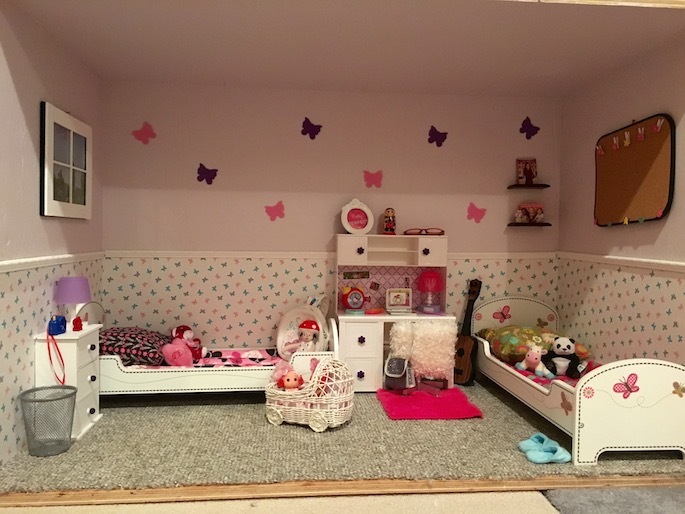 It is tricky to tell in the pictures as the lighting in the dollhouse isn’t very good. I am still contemplating putting in lights. 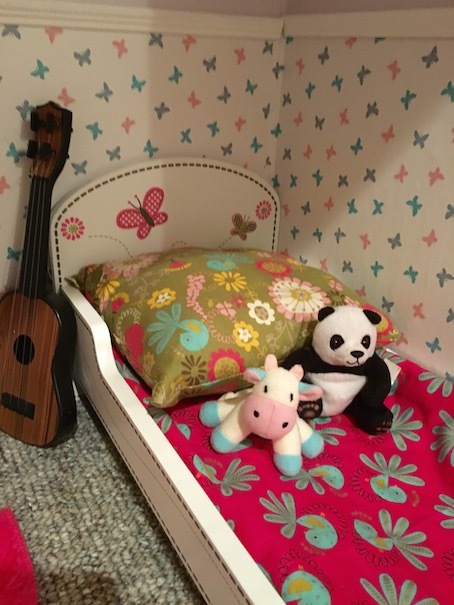 I sewed all of the bedding and the pillows for the beds a while back, but I am thinking that I might make new bedding if I can find some pretty butterfly fabrics. 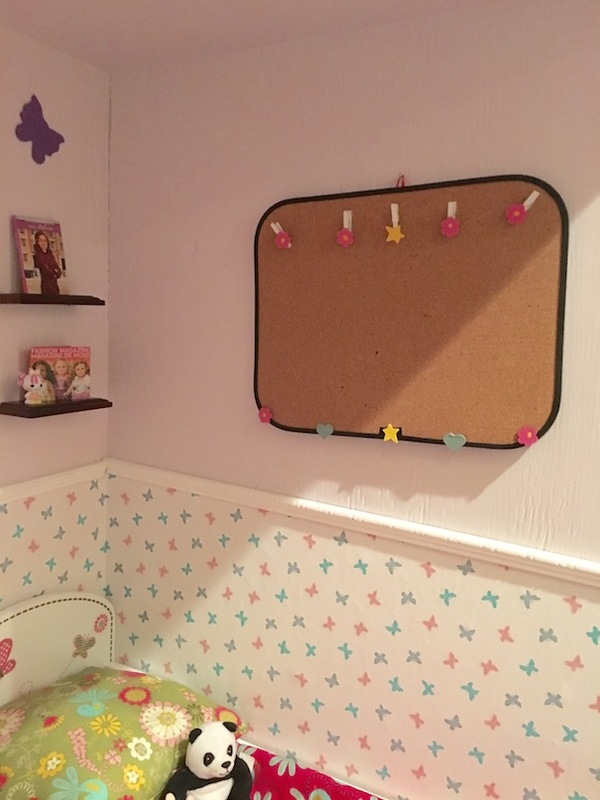 The bulletin board is from the dollar store. I just glued on some mini clothespins. I’m not a fan of using real push pins in my doll crafting, so the dolls can hang their artwork on the clothespins instead. 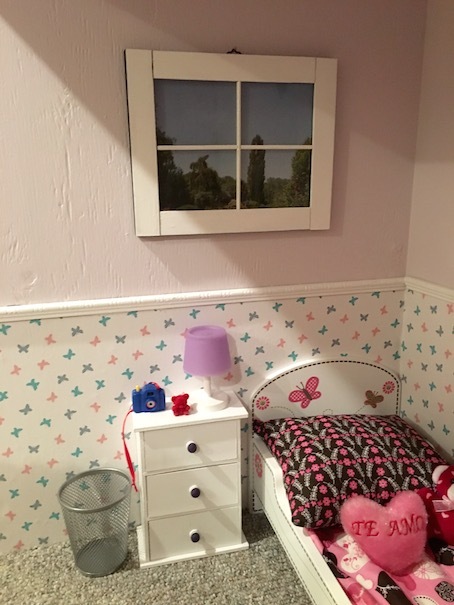 The window is just a picture frame with a magazine page inside. I painted some straws white, and glued them to the glass for the cross section. The waste basket is from the dollar store. I will probably put one in each of the bedrooms as they came as a set of three. The night stand was also a dollar store item. I painted it white, and I painted the knobs dark purple to match the desk drawer knobs. 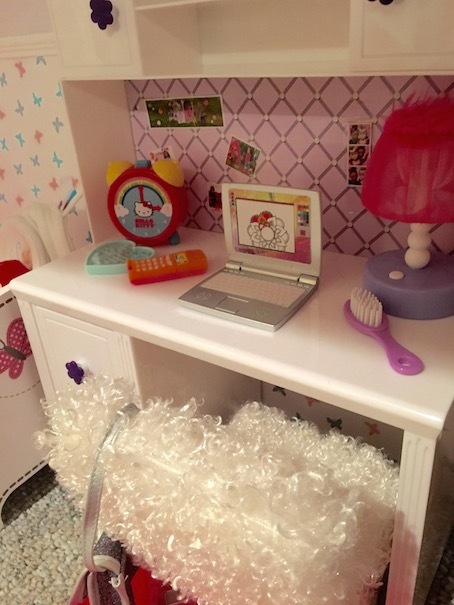 This is the MyLifeAs doll desk. We purchased it from Walmart a while ago. I really like it a lot. 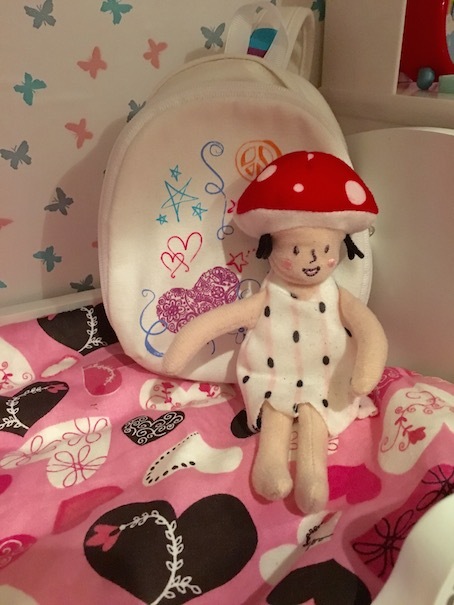 It is one of our favourite doll furniture items. 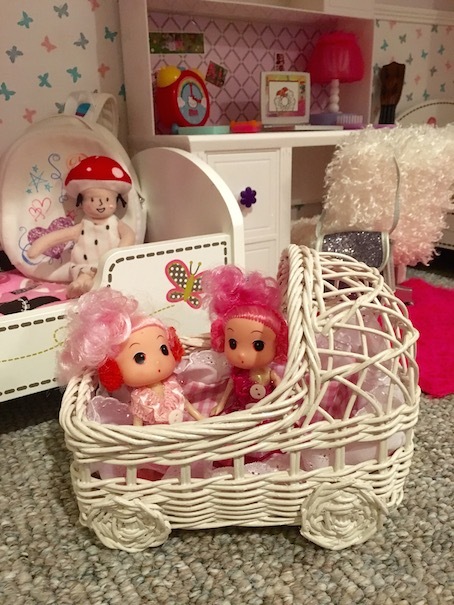 I have to say, I am so happy that all of our doll pieces are finally finding a forever home. It was getting so frustrating with everything spilling out all over the floor all the time! Now everything will have a place! Okay, now let’s see what the dolls think!! 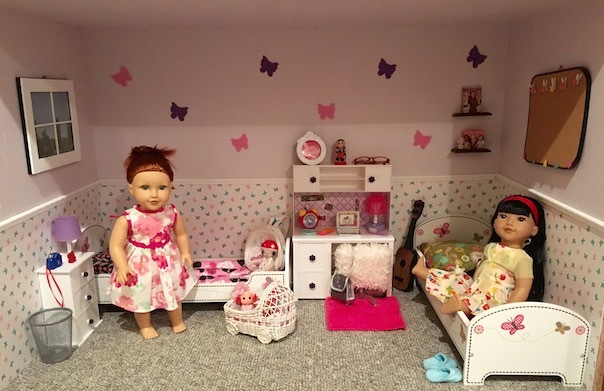 Lily and Abby are here to check out the new doll room! Ohmygoodness! They look so cute! Be sure to tune in this time next week for the third room reveal! Also, if you missed it, check out our dollhouse kitchen! 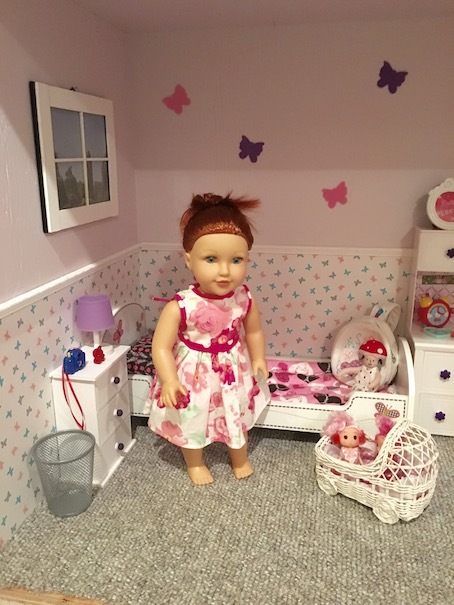 Creating spaces for dolls is a fun adventure! 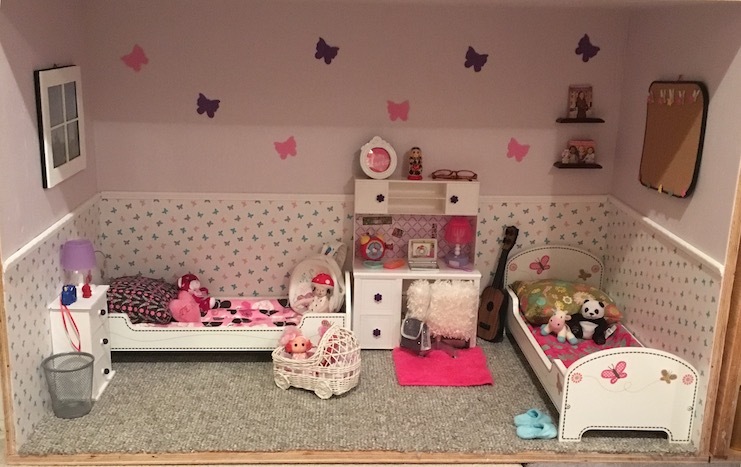 You did a wonderful job with great finds and your own creativity! BRAVO! Very cute! 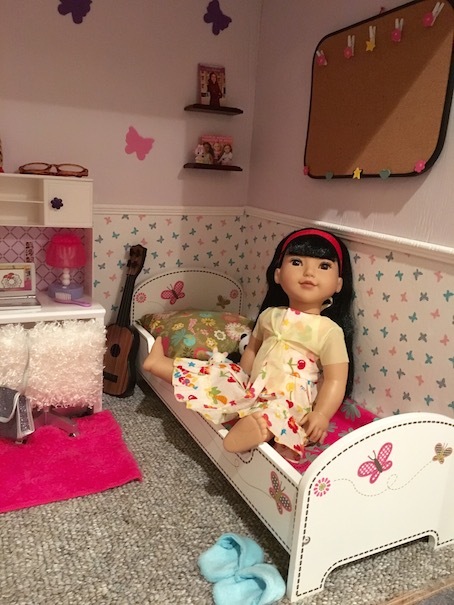 I think doll bedrooms are my favorite to work on, there is so much you can use for in it.